Home to the community of Austinville, located near Foster falls, Stephen and Moses Austin took over the mines that produced led and zinc. The Jackson Ferry Shot Tower still remains as a historical monumnet. Molten lead was hoisted to the top of the tower where it was then dropped through a sieve. The droplets of led were round by the time they hit the bottom of the chamber, where they were then collected and used as shot for rifles. The mines were closed in 1982 and have since filled with water. 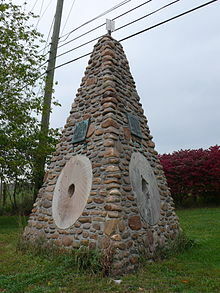 Also a part of Wythe History in Wythe County is the town of Fort Chiswell, so named for a French/Indian war era fort. 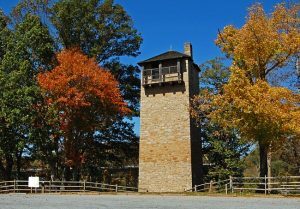 That fort served as the county seat for many years. The fort fell into disrepair and its ruins were covered over by the intersection of I-77 and I-81 in the 1970s. Polio Epidemic in Wythe History: What started off as a few cases of infantile paralysis during the summer of 1950 swelled into the hundreds. Out of the 5,513 inhabitants of the town,184 people contracted the disease with 17 fatalities. From the beginning of June until the end of August, parents kept children inside and large gatherings were cancelled to diminish the chance of infection. As the epidemic progressed, ambulances drove victims approximately 80 miles (130 km) trip to Memorial Crippled Children’s Hospital in Roanoke, Virginia. Hearses from local funeral homes were used when ambulances were unavailable. African-American patients with polio were repeatedly denied admission to Roanoke’s hospital and were forced to make the approximately 300 miles (480 km) trip drive to St. Philip’s Hospital in Richmond. The Town Council erected billboards at all five entrances to the county warning potential visitors of the epidemic and urging tourists to come again the following year. By the end of the summer, unknown assailants stole or demolished all five billboards. Though the Town Council offered a reward for information, no one came forward. 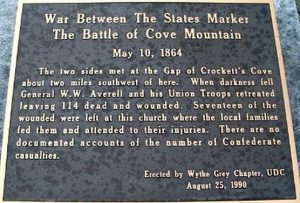 The Crockett’s Cove Presbyterian Church, Haller-Gibboney Rock House, Loretto, St. John’s Episcopal Church, St. John’s Lutheran Church and Cemetery, Wythe County Poorhouse Farm, and Wytheville Historic District are listed on the National Register of Historic Places.